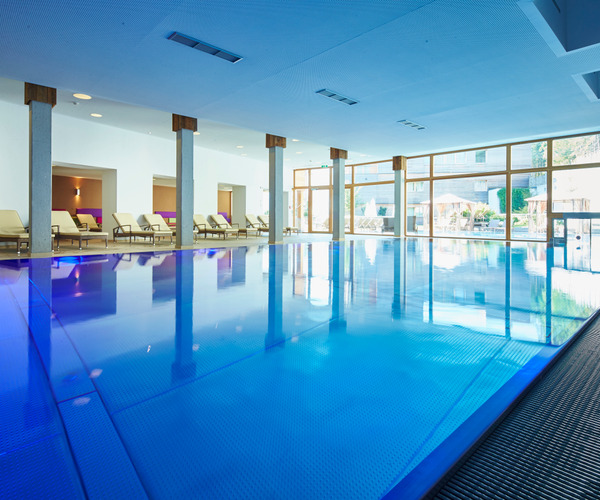 In an enviable location on Lake Achen in Achenkirch, Austria, Alpine Lifestyle Hotel DAS KRONTHALER****S (4-Star Superior) introduces guests to an alpine lifestyle and wellness holiday filled with spa treatments and seasonal athletic pursuits. Elegant and secluded, the hideaway delights the senses with regal mountain, valley, and lake vistas; gourmet Tyrolean dishes; cosy fireplaces, and other four-star luxuries. An on-site spa embraces wellness from every aspect, from its landscape to its lavish appointments: five varied saunas, a heated indoor and outdoor pool, and bevy of treatments designed for health and vitality. Ample sports abound, celebrating the beauty of Lake Achen all the way to the Karwendel and Rofan mountains. The alpine resort on Tyrolean Lake Achen dedicates 2,500 square meters to wellness and spa. The peaceful natural surroundings permeate the haven, renewing the senses and inspiring guests to embark on a mind-body journey. The spa offers guests five different saunas—including a large Finnish sauna, salt grotto, and bio sauna infused with Tyrolean herbal extracts—along with an indoor-outdoor swimming pool, and a menu comprised of massage, Abhyanga, hydrotherapy, scrubs, and wraps; overnight spa packages are also available. Revitalizing services are accompanied by products from the Susanne Kaufmann and Horst Kirchberger lines. Thoughtful details like an open-air relaxation zone capitalize on the amazing landscape and invigorating mountain air. Additional wellness amenities comprise a beauty salon and gym that sports a Kinesis power station. Fitness aficionados will find a variety of year-round exercise options that celebrate the picturesque sports park of Lake Achen, as well as the region of the Karwendel Mountains to the west and Rofan Mountains to the east. Five-hundred kilometres of hiking trails entice nature enthusiasts to challenge themselves on the intense Karwendel Alps and the 2,457-meter Sonnjoch, or trek the less strenuous Karwendel valleys of Pertisau. The warmer months also bring about guided or solo Nordic walking, mountain biking, horseback riding, and golf. Come winter, ample snow sports abound. Ski-in/ski-out access accommodates skiers, who can schuss the slopes 1,900 meters above sea level, or hone their skills at the on-site school, under the watchful eye of instructors and guides. The centrepiece of the alpine nature is the shimmering Lake Achen: the large body of water beckons surfers, kite surfers, boaters, swimmers, and sailors. Stylish alpine-chic guest room interiors complete with Lake Achen and mountain views, set the tone for a relaxed stay. Accommodation appointments include a balcony or terrace and comfy lounge area; lovely bathrooms feature a tub and wellness shower. Family suites with separate living and sleeping zones and top-floor chalets—which boast private spas, living rooms with open fireplaces, and oversized terraces—cater to those traveling with a large group. Alpine Lifestyle Hotel Das Kronthaler****S (4-Star Superior) prides itself on treating guests to authentic gourmet alpine cuisine. Diners will feast on traditional Tyrolean dishes with a contemporary twist, paired with Austrian and international vintages from an exceptional wine collection.